Figure #153 or ‘The Claw’/‘The Hand’ as he is most often referred to was available in the M.U.S.C.L.E. 4 & 10 Packs and is probably the figure most people remember from when they were a kid. No other figure seems to hold the popularity this figure enjoys, especially when he is in a colour that is hard to come by. The coloured Claws have of late, been commanding higher and higher prices on auction sites and if and when a Purple Claw appears all hell breaks loose! 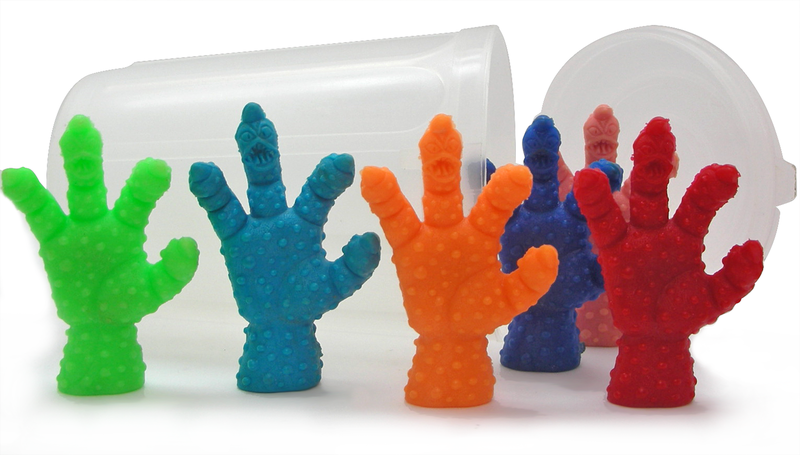 The original Flesh Claw is very common but always costs more than any other flesh poster figure. Whenever he appears in a M.U.S.C.L.E. figure lot, the lot is guaranteed to sell just because he is in there. Some sellers, mainly non-collectors who have come across M.U.S.C.L.E. on auction sites, are currently seeing coloured Claws going for big, big bucks, so they think they can dig out their old figures and sell their old Flesh Claw for silly money, this is nonsense! Flesh Claws are frequently available through various sources and an average price seems to be around £8.00- £12.00, which is still a lot for a flesh poster figure, but hey, its The Claw! These are the only Class B Claws out of the 8 colours #153 was available in and they tend to hold a consistent higher price, especially Salmon. The Red Claw does appear more frequently than Salmon, but nowhere near as much as say, a Light Blue Claw. The Salmon Claw is consistently the most expensive colour after Purple. 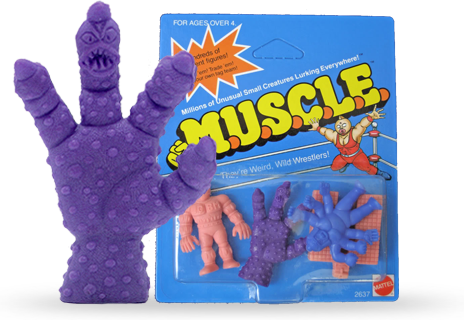 One of the holy grails of M.U.S.C.L.E. collecting! – The elusive Purple Claw! This colour #153 very rarely appears and when he does he can command obscene amounts of money. When veteran M.U.S.C.L.E. collectors Soupie and Universal Ruler Supreme (LRG screen names) worked out all the Kinnikuman/M.U.S.C.L.E. molding ‘Trees’ it showed that #153 came from Part 8, Tree 3, which indicates that purple figures #003, #138 and #155 would have also been produced in the same numbers. These purple figures are indeed classed as rare, but they have never reached prices that The Claw has, it is just further confirmation of The Claw’s status as the most desirable M.U.S.C.L.E. sculpt. So how many Purple Claws are out there? Class A, with less than 20 known examples in the collecting community. This is what causes the most mystery for collectors as in theory there should be more circulating. He is featured on the mail-away Colour Poster, so this suggests there are more Purple Claws just waiting to be discovered, maybe there are and they are just sitting in an old box somehwere with its owner unaware of a community of collectors willing to pay hundreds of dollars for an unpackaged, loose figure! 99% of the time he is sold as a single figure and hasn’t appeared in a figure lot for a very long time, indicating there are most likely not many in circulation and the majority of the ones that are will probably be located in Canada like a lot of other Class A’s. 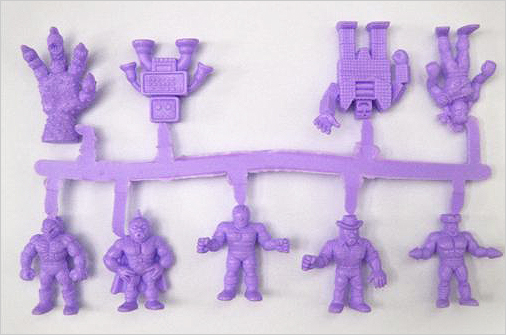 Although many Class A figures appear in UK figure lots, there has yet to be a Purple Claw discovered, further supporting the idea that the majority of them are probably located in and around Canada. To give you an idea of prices – a Purple #153 was auctioned on LittleRubberGuys in 2011 but the auction ended early for $1,300. A few single figures have popped up on auction sites over the years since then, but the price very rarely drops below $600. Bootlegs on the other hand appear quite frequently, not surprising given the prices a legit Purple #153 can command! A few years ago, an LittleRubberGuys member named arforbes claimed to have in his posession a Grape coloured Kinnikuman Part 8, Trees 1 & 3. The photo shows the Grape coloured Mega-Match Board Game figures every collector is familiar with but it also includes a Grape #153 and three other figures not released in Grape; #003, #138 and #155. Before Soupie and Universal Ruler Supreme broke the M.U.S.C.L.E. Color Code collector’s assumed that each figure was made in all 9 colours (inc. Flesh). Some people claimed to of had a Magenta Claw when they were a kid, but thanks to the colour code all speculation was put to bed – #153 was made in all colours except Magenta. If you ever see a Magenta Claw, you can be sure its a fake.